Every time this curious Humpback lifts its head or fins above water, screams of appreciation can be heard from nearby boats. What the spectators don’t know is that they’re missing the show! An underwater camera provides a complete view of this magnificent animal as it explores the underbelly of the boat. 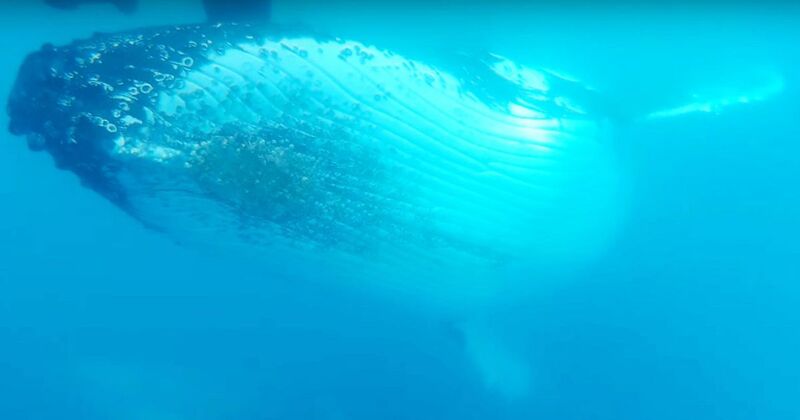 At one point, the whale even seems to explore the camera. It turns towards the lens and nods its massive head right in front of the device. You couldn’t ask for a better view. This particular whale was spotted near Hervey Bay in Queensland, Australia. The bay is a Humpback hot spot from July through November each year when the whales return to Antarctica with their newborn calves. A few days in the bay’s quiet waters make the long migration less grueling for the small whales, who are undertaking their very first migration. These safe waters are also an ideal place for calves to learn several whale tricks. Baby whales can be seen practicing tail flops, head lunges, and pectoral slaps. These skills may seem like fun and games, but they are much more. If the calves are unlucky enough to suffer an Orca attack during their long journey, these tricks will become essential to their survival. The calves are also putting on some much-needed weight. A baby Humpback eats over 200 liters of milk each day. This isn't an accident. The babes are buffing up for migration. Every extra pound gained is one more pound they can use against an attacking Orca or male Humpback interested in mating with their mother. The same whales tend to visit the bay each year, so they have grown accustomed to the boats and tourists. This makes whale watching in Hervey Bay a particularly thrilling experience because of some whales, like the one in this video, get quite close to the boats.